New material includes the report of Rabbi Aaron Teitelbaum's efforts to stop the massacre of Armenians in one Turkish town. During the first years of the 20th Century the Jewish population of Eretz Yisrael -- Palestine -- suffered terribly. A massive plague of locusts, famine and disease hit the community hard. Ottoman officials harassed, tortured, imprisoned and expelled Jews, especially "Zionist" activists. In spite of all efforts made in Palestine to cope with the situation, the Jewish population would have succumbed had not financial help arrived from America. From the day when war [World War I] broke out [Jewish] Palestine had appealed to America for help. ﻿ On October 6th, 1914, the American warship "[the USS] North Carolina" landed in the harbor of Jaffa, and the envoy of Ambassador Morgenthau, M. Wertheim, brought $50,000 dollars. 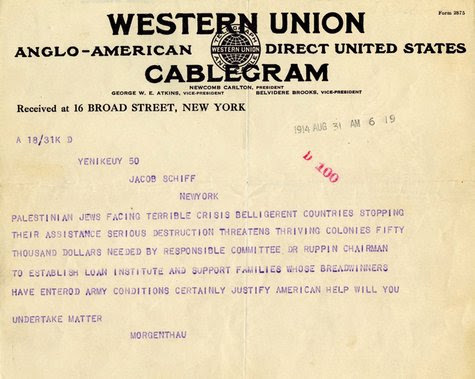 Half of this sum had been given by Jacob Schiff, the other half by the Zionist Organization with Nathan Strauss. The arrival of this warship and of those that followed it was quite an event in the country. It raised the downcast spirits of the Jews, who saw that they were not abandoned, but could reckon on help from their brethren abroad. These ships also increased the prestige of the Jews in the eyes of the rest of the population and of the local administration. 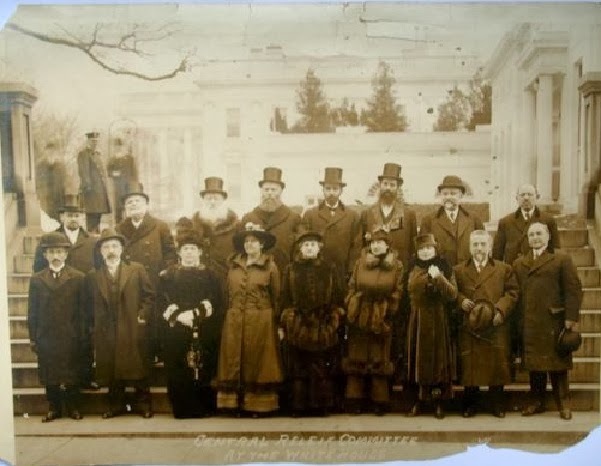 People saw that the Jews through their connections abroad were much more powerful than their numbers would have led one to expect. These American ships continued their good services on behalf of the Jewish Yishuv. They brought money from time to time, and hospitably took on board the expelled Jews and the other immigrants who fled from Palestine for fear of starvation and persecution. The transmission of the money, which was a task requiring considerable address and scrupulous care, was carried out admirably. Besides money, food also came from America on a special ship, the "Vulcan.'' 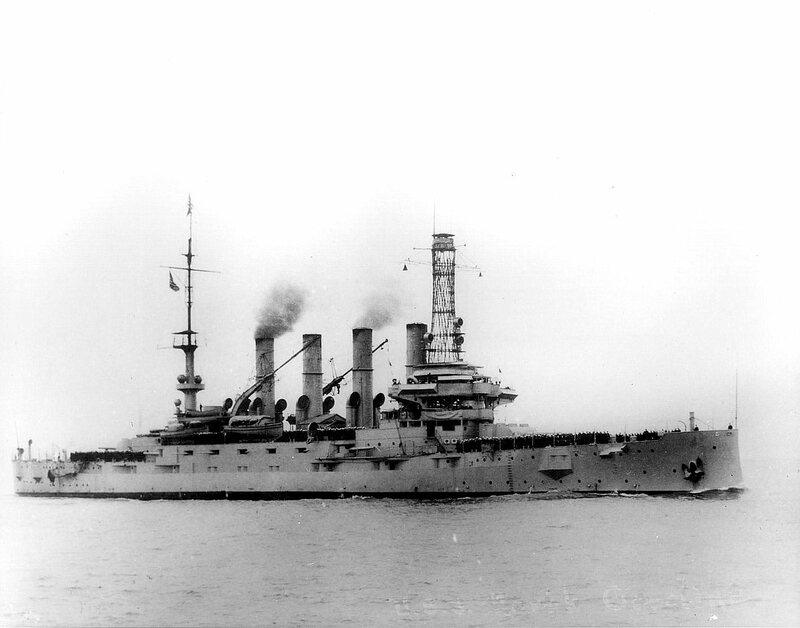 Altogether, from October, 1915, 3,522,930.03 francs were brought to Palestine in 13 American ships. Here is an additional report about a rabbi on one of those American ships, shared by his great-grandson Yitz. I have always heard that my great-grandfather Rabbi Aaron Teitelbaum of Jerusalem and New York who was one of the founders of the Joint Distribution Committee as well as its founding Secretary at some point was on one of these boats. In order to travel on an American naval vessel even as an American citizen (which he was) he was required to and received some sort of official naval commission. Three years ago while cleaning out his son's house I found postcard photographs of him arriving in various places from that ship. I do not know which ship he was on but family lore says at some point he ended up being in Turkey during the slaughter of the Armenians. He managed to stop the slaughter in the town he was at by convincing whoever was in charge that if the slaughter did not stop he as an American officer aboard an American naval vessel would order his battleship which was in the harbor to begin shelling their positions. Obviously he couldn't do this but whoever it was in control decided not to test him and stopped the slaughter. Supposedly when he returned to Jerusalem the Armenian prelate came to him and hugged him and kissed him for his actions.